If you’re interested in applying for an opportunity in your area visit your local franchise location and ask for an official Robeks job application. Because the bulk of the company’s locations are owned/operated by independent franchisees, there is currently no online application available. Follow the instructions in the guide posted below to learn how to get in touch with your local franchise (regarding employment opportunities). 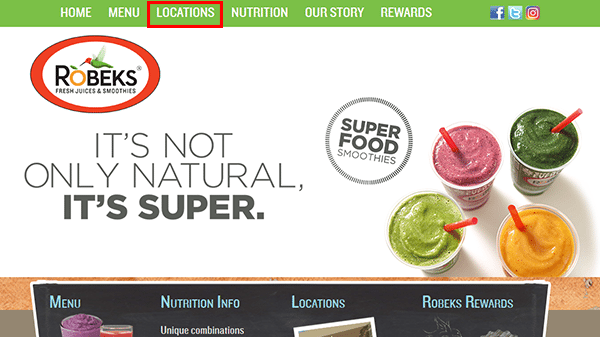 About the Company: Robeks is an American chain of smoothie shops that is based out of Los Angeles, California. The company was founded in 1996, and currently has over 90 locations throughout the United States (as well as abroad). Robeks is a privately owned company. Step 1 – The first step in the application process is to go to the company’s homepage. Click this link to open the homepage in a separate browser window or tab. 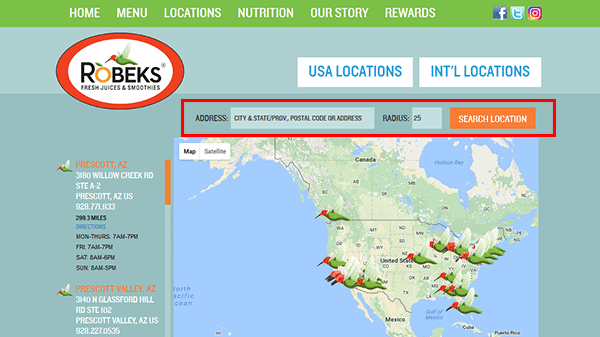 Step 2 – Once you’ve arrived on the homepage click the “Locations” link as outlined in the below screenshot. This will take you to the location finder. Step 3 – Enter your city/state, zip/postal code, or address into the first input field. Select/enter a search radius in the second input field and then click the “Search Location” button to load the results. Note: If you’re located outside of the United States click the “Int’l Locations” button to load the international location finder. Step 4 – Click the location that you want to apply to in order to view its contact information. Call the number and ask to speak to a manager. You can also visit the location in person and ask for a manager (or ask for an application). Note: Some franchise locations may have online application capabilities. Contact the locations in your area to learn more about their career opportunities/openings.